(Nanowerk News) Bruker Corporation today announced that it has launched the ContourSP large panel metrology system, which more than doubles the measurement throughput of the high-density interconnect (HDI) substrates in multi-chip modules (MCM) over previous generation SP models used by the semiconductor packaging industry. 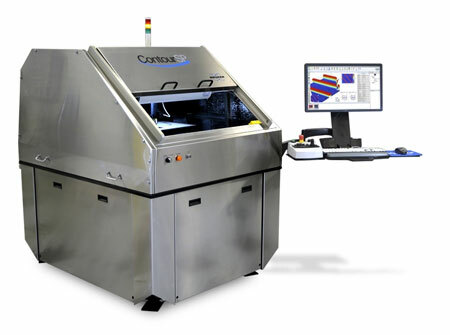 Specifically designed to measure each layer of the printed circuit board (PCB) panels during manufacturing, the gage-capable ContourSP assures the minimum recipe development time, highest yield, maximum up-time, and lowest cost per measured panel in production. These features have already led to over $5 million in orders by several leading HDI/MCM PCB manufacturers. Bruker's ContourSP 3D Optical Microscope for the Printed Circuit Board Industry. Based on white light interferometry, the ContourSP incorporates decades of packaging and panel measurement experience to provide unprecedented speed, metrology capability, reliability, serviceability, and manufacturing readiness for 3D critical dimension measurements in MCM and HDI PCB applications. Bruker’s high-performance 3D optical microscopes feature Vision64 operating and analysis software, and the industry's most intuitive, modular user interface to deliver user-level-customization capabilities for the widest possible range of surface profiling metrology applications. The ContourSP also utilizes Bruker’s revolutionary gantry-based design and integrated workstation to support up to 600x600-millimeter samples in a highly compact footprint.